As I walk down the empty, dimly lit street, I begin to rethink my hasty decision to explore the neighborhood around work so late. This is the first chance I’ve had to explore since starting my residency here. With everyone’s assurance about the safety of the area, I was excited to step out on this new, mini adventure. Looking down the street at all the dark closed shops, the doubt begins to trickle in. Perhaps I should have waited for some daylight before I started exploring. As I pass an alley, a loud crash causes me to leap back clutching my chest. My eyes dart about searching for the source, as the panic begins to subside. “Meow,” the sound floats from the shadow causing my heart to jump again before I spot the source; a sleek white cat slinking around in the shadows. “Just a cat,” a sheepish smile spreads across my face but is wiped away immediately as I catch movement out of the corner of my eye. My eyes dart back, but there’s nothing for me to find. Maybe these long hours and late nights are making me delusional? I continue on, but I can’t shake the feeling that I’m not alone. I can’t help but to look back every few steps as my pace begins to quicken. I think my time on this street needs to come to an end. 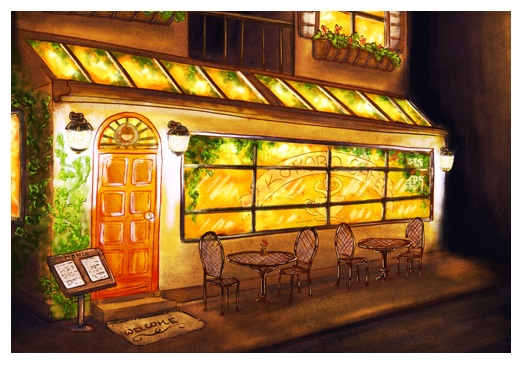 A couple blocks down and my eyes fall upon the lights of a quaint café. It shines like a beacon in the night; a lighthouse guiding a lost ship. I pick up the pace, jogging the last bit. I pause at the door for a brief glance over my shoulder before slipping into the warm welcoming light of the café. I like it so far! Just one little nitpick. "whipped away immediately" should be "wiped away immediately"
[member=3652]Washu_Takahashi[/member] Glad you like it ^_^ I thought about that too, but I thought whipped might convey how fast the smile disappeared better than wipe, even though wipe is typically what's used. Does anybody know the name of this game?